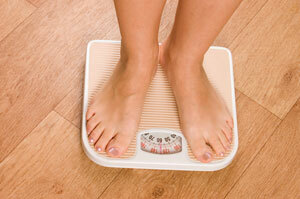 Carrying extra weight worsens fibromyalgia symptoms. A new study linked severe obesity with an increase in fibromyalgia symptoms and decreased quality of life. Researchers from the Mayo Clinic evaluated 888 women with fibromyalgia (FM). Patients were assessed for FM symptoms, BMI levels, quality of life, and more. The higher a woman’s BMI, the more likely she was to suffer from additional FM symptoms and a poorer quality of life. Specifically, severely obese women had worse physical function, more stiffness and pain, more work absenteeism, and greater levels of depression. Earlier research established a connection between fibromyalgia and obesity. A 2010 study suggested that a high BMI is “a strong and independent risk factor for future development of FM.” In that study, inactive women were more likely to develop FM while women who exercised four or more times a week lowered their FM risk by 29%. But exercise doesn’t just ward off fibromyalgia, it also reduces pain for patients that already have the condition. A recent study suggests that tai chi can significantly improve symptoms for FM patients. Chul-Hyun, Kim. Association of body mass index with symptom severity and quality of life in patients with fibromyalgia. Arthritis Care & Research 2012; 64(2): 222-228. Mork, Paul, et al. Association between physical exercise, Body Mass Index, and rise of fibromyalgia: longitudinal data from the Norwegian Nord-Trøndelag Health Study. Arthritis Care & Research 2010; doi:10.1002/acr.20118. Written by: Marissa Luck on July 4, 2012.Modified on March 12, 2013.